The December 9th report on 2015 school performance levels from the state Department of Elementary and Secondary Education (DESE) shows little change for Boston Public Schools (BPS) from 2014, due mainly to the adoption of the PARCC exam in grades three through eight. This year, 66 BPS schools (64.1%) are classified as underperforming, (Level 3 or below), up from 65 schools (63.7%) in 2014. In the current school year, 30,439 students attend an underperforming school, which represents 61.8% of the BPS student body attending schools assigned performance levels. 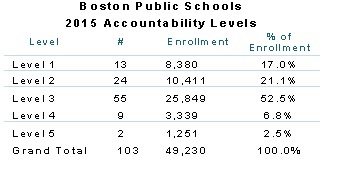 Boston currently operates 125 public schools, 103 of which were assigned a state Level in 2014. The excluded schools provide adult education, various support programs, early education, are too new to have four years of data, or are Horace Mann in-district charter schools. This year, the state held all PARCC schools harmless on performance levels. As a result, only BPS high schools, which continued to administer the MCAS to 10th graders, were subject to a potential downgrade in performance level. The most significant change this year was Madison Park High School being assigned to Level 4 status. If implemented correctly, the Level 4 turnaround plan could give the BPS the tools and flexibility needed to improve the District’s only vocational school. While BPS contains 6.4% of schools assigned a 2015 performance level statewide, its share of the state’s underperforming schools is 20.3% a slight increase from 19.5% in 2014. In October 2013, the state took over two under performing BPS elementary schools. Receivers selected by the DESE Commissioner, UP Education Network at the Holland Elementary Schools, and Blueprint Schools Network at the Dever Elementary, are tasked with turning around these Level 5 schools. As part of the state takeover, collective bargaining agreements have been reopened and renegotiated, allowing the District to implement a new performance based pay structure in these schools for the current school year.